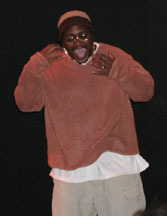 Besskepp (Cory Cofer) is a quick-witted-beatnik60's-hiphop80's poet raised on Langston Hughes and Public Enemy. Everything he has experienced has been documented through poems, journal entries and monologues. He tackles socio-political and racial issues with an animated grace. He's traveled throughout the country as a member of the Los Angeles National Slam Team (2000, 2001) and has shared the stage with such artist as Mos Def, Saul Williams, Slum Village, Mystic, Ursella Rucker, The Visionaries Poet/activist Jerry Quickley and many other artist who are successful in exerting their creative energy. Besskepp has performed in over 100 shows including universities, conferences, festivals, coffee houses and competitions in the last few years. His poetry addresses pertinent issues as equal rights, single-parent families, the importance of education, and how hip hop culture influences our society. He's a school teacher who has been twice awarded Teacher of the Year in his first five years of teaching. Besskepp was recently featured in the Los Angeles Times for using hip hop as a teaching-tool in the classroom. His weekly poetry reading, A Mic & Dim Lights in Pomona is the 2nd largest and one of the longest-running weekly readings in California. His cd Bluze Langwij takes spoken-word poetry to the next level and has been played regularly on KCRW's Chocolate City with Garth Trinidad. It has also been successfully reviewed by Rock and Rap Confidential, Digress Magazine, and Getunderground.com.